SWMS reviewed according to our continual improvement processes will be released for purchase as they become available, so stay tuned for updates. Demonstrate your organisations commitment to continual improvement and ensure you're SWMS documents are up to date by upgrading your existing Safe Work Method Statements. "Simple to follow, editable plan for anyone who is first time filling out a contractor approval of this scale. There are a few things that need to be changed depending on type of work the contract is for, but besides that a very well set out plan. " 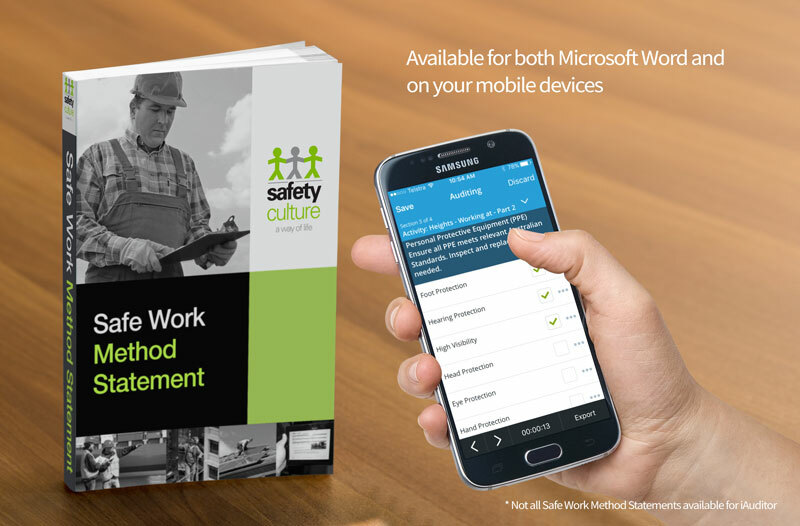 A Safe Work Method Statement - also referred to as a SWMS - is primarily used to train your workers in the safe use of an item of equipment or work activity. The reason your builder or principle contractor is insisting on it, is that they seek WRITTEN proof of that safety training, and a SWMS is the accepted format for that. It is a legislative requirement that a written Safe Work Method Statement (SWMS) is produced for work which is determined to be High Risk Construction Work under the WHS Act. The purpose of a SWMS is to enable all people involved with specific high risk construction work to have a full understanding of the risks involved with undertaking that work and to implement the risk controls outlined in the SWMS thereby increasing workplace safety. Persons Conducting a Business or Undertaking (PCBUs) must ensure that SWMS are prepared for all high construction work before work is commenced. It is recommended that all SWMS are kept on-site or at a location where they can be delivered to the site promptly. SWMS are also referred to by many other terms including, Safe Work Method Statements, Work Method Statements, Safe Work Methods, SWM, WMS. How does a SWMS TEMPLATE work? Our SWMS TEMPLATES are ready to use. They are not blank templates. Once you've downloaded the appropriate product, you just insert your company details and ABN. You include any site specific details, the risks and make it specific to the task at hand. Then simply print and use as part of your OHS System. describe how the risk control measures are to be implemented, monitored and reviewed. It is important that the information included in SWMS is clearly set out, be easily accessible and fully understood by all site supervisors and workers. The content of a SWMS should provide adequate directions on how the risk controls will be implemented. The PCBU must ensure SWMS are prepared for any high risk construction work they intend to carry out. SWMS should be developed in consultation with workers directly involved with the work. If more than one PCPU is undertaking work at the same worksite, then consultation between each PCPU regarding the content of SWMS is required to ensure consistency in the way work will be carried out on that site. SWMS are used by Principal Contractors, site supervisors, contractors, sub Contractors, Health & Safety Representatives (HSR?s) and any other workers on-site who may be directly affected by the work being carried out. The SWMS must be kept and be available for inspection at least until the high-risk construction work is completed. If a SWMS is revised, all versions must be kept. If a notifiable incident occurs in connection with the high-risk construction work to which the SWMS relates then the SWMS must be kept for at least 2 years from the occurrence of the notifiable incident. The PCBU must carry out the review of SWMS in consultation with Principal Contractors, contractors, subcontractors, workers and any relevant HSR's at the worksite. Enter coupon code SWMS10 at checkout. *Applies to SafetyCulture Safe Work Method Statements only.